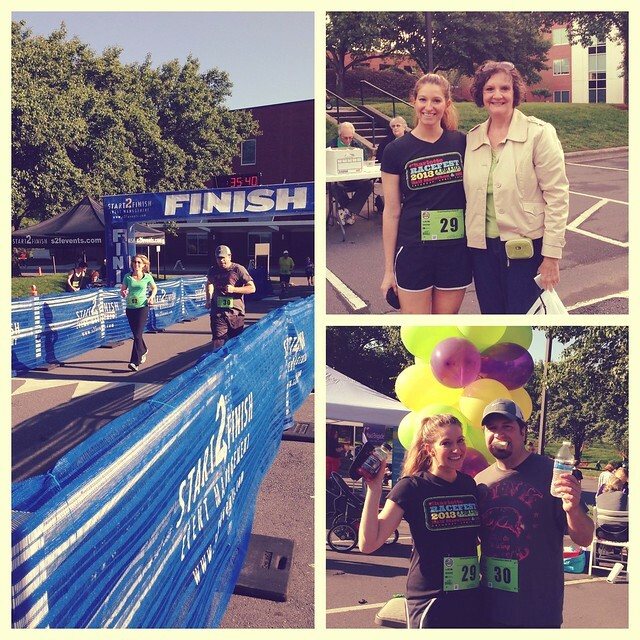 This past Sunday, I ran The Friends Run 5K, which happened to fall on Mother's Day, and my mom happened to be in town from PA for a visit. Since she had never seen me race before, she thought it would be fun if I ran a race while she was here. This is a smaller race by Charlotte standards (about 150 people) and this was the third year for the race. Overall, it was a fun experience with a nice, shaded course, and I came in first in my age group! And while I didn't PR, I ran the race in 24:08 with a pace of 7:47/mile. I knew this was a smaller race where I would have a chance in coming in at the top of my age group (as opposed to the larger races with several hundred people where I've typically come in somewhere between 4 and 10 for the shorter distances), but I definitely didn't think I'd come in first! So that was a fun surprise and a nice Mother's Day experience for my mom. Dave raced, too, and came in with another PR just a few weeks after his last PR! As far as the race goods, there is an actual race packet for this race, as opposed the virtual ones that most races use. 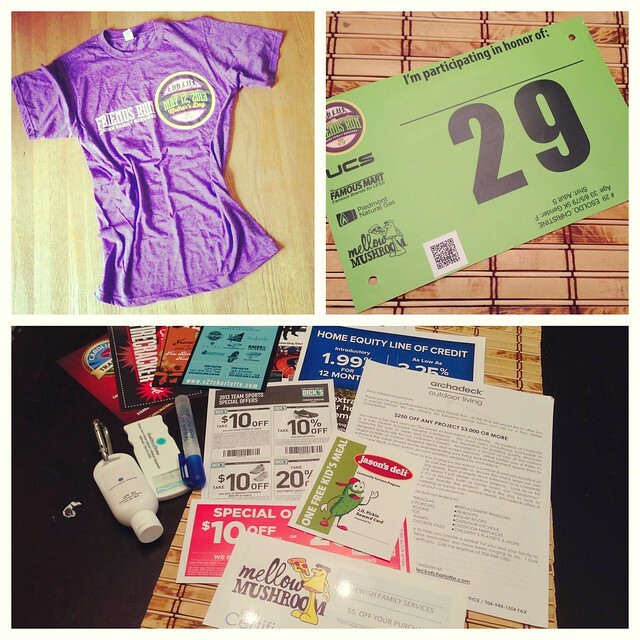 The packet contained some coupons for local restaurants and services, postcards for upcoming races, and sunscreen, hand sanitizer, and band-aids (all things one could probably use at a race, especially the hand sanitizer for those pleasant trips to the porta-johns). While I prefer virtual race packets for coupons and such, it was nice that this race included some other items. The t-shirt (for women, at least) was a pretty heathered purple and a nice material with a nice, drapey fit (much like the CPCC shirt, although it was a different brand). Men got grey shirts that didn't seem to be quite as nice as the women's shirts, but better quality that a lot of other race t-shirts I've seen. 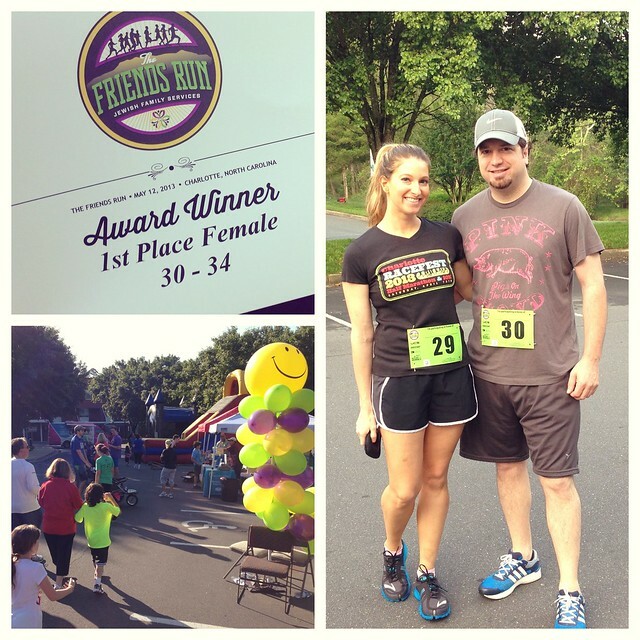 The race awards went to top three male overall, top three female overall, and first in each age division. Winners received a certificate and a cookbook. Since I've never placed before, I have no point of comparison for what the awards were (although, I do know bigger races give money to the top finishers). But I like to cook (and eat)! I'll take the cookbook! Timing was done by Start2Finish Timing and the chip was right on the bib, which I prefer to the chips that I have to tie onto my shoe. Bib chips just give me one less thing to worry about. There didn't appear to be a chip sensor at the start of the race and the times are referred to as "Elapsed Time," so I'm assuming there was only a chip sensor at the end. This seems okay for a smaller race where it's not hard to get out in front pretty quickly, but as this race grows (which I'm sure it will), it would be nice to see chip sensors at the start, too. As is typical with most Charlotte courses, this one had rolling hills and inclines. It actually had a deceptive amount of steady inclines and I wouldn't call this a "fast" course. But it is a pretty one and goes through a residential area that is almost entirely shaded, similar to the Elizabeth 8K. What was missing from this course, though, was crowd support. There was hardly any. I saw just a few people out at various spots, but again, as this race grows, hopefully crowd support will, too. Other nice touches included local news station coverage and a finish line video, as well as free yogurt and pizza for racers plus the standard bananas, oranges, bagels, power aid, and water at the finish. Another good race and I'm sure I'll be back next year.